The first local trade directory entry for Herbert Gregory is in 1908, but there is a Henry Gregory, listed as stationer, (perhaps a printing error?) 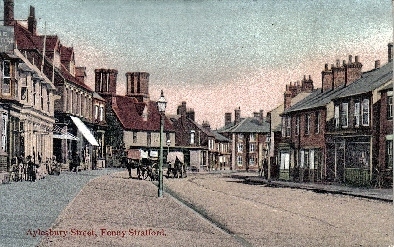 in 1906. 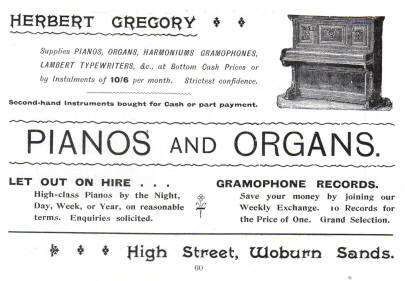 Gregory had his own print works, “The Sandpine Printing Press”, for his stationery, and supplemented his printing business by selling pianos, organs, violins and gramophones. The name Sandpine seems to fluctuate, and is sometimes Sanpine instead. 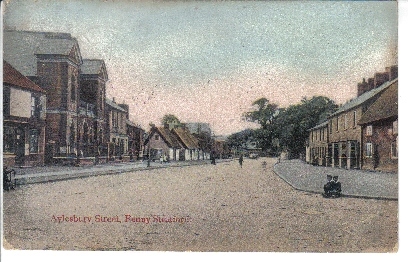 which dates from about 1904. In July 1952, exact copies of this book were produced and sold at an exhibition about Woburn Sands history, which was held at a fete in the Vicarage gardens. There is no indication in these later reprints that they are copies, so it is difficult to tell the originals from the reprints. 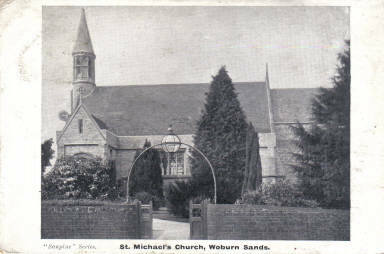 Gregory is also responsible for giving the village its first dedicated newspapers, with “The Woburn Sands Messenger” in 1905, and “The Woburn Sands Echo” in 1906. 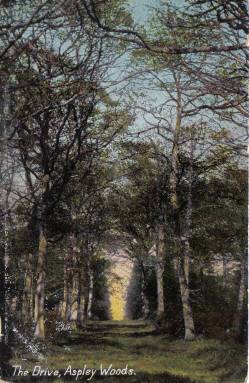 An edition of the Echo in April 1906 lists 31 of his local postcard views, but later cards did not have any index numbers. He also produced some in conjunction with Valentines, a national postcard company. I have managed to collect most of the numbered series, and many other un-numbered Gregory cards, and these are displayed below. Whatever materials and process was used in the production of these cards, the images are quite brittle and are often chipped at the edges, which spoils some. They have usually been hand-tinted, and occasionally some liberties have been taken with the colours, compared to the original buildings! 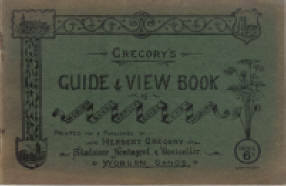 The various styles of backs of postcards that Gregory produced. They are usually nice tinted cards, but there appears to be some crossover with the cards issued by Robert Cheetham. Perhaps Gregory bought the images wholesale from Cheetham, then issued them under his own name. “Sandpine Series No.1”. 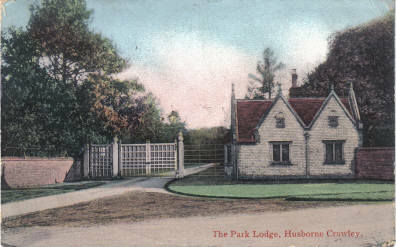 Park Lodge, Husborne Crawley. 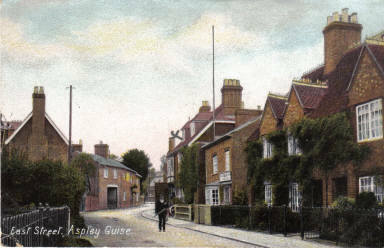 Sent to Royston, to ask ‘Miss G.’ if she would send ‘Miss L’s’ address to Mabel. Two postmarks are both unclear, but it looks like 1906. “Sandpine Series No.2”. 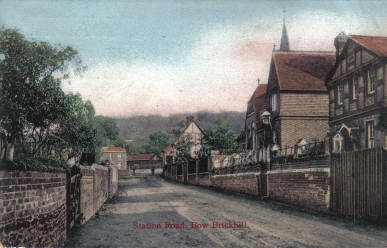 Looking up Church Road in Bow Brickhill. 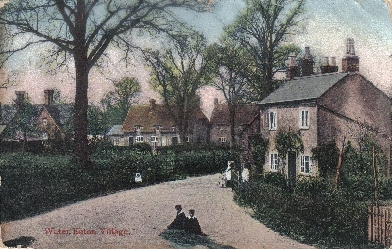 The Plough Inn, long since closed, stands on the left. An unsent card. “Sandpine Series No.3”. 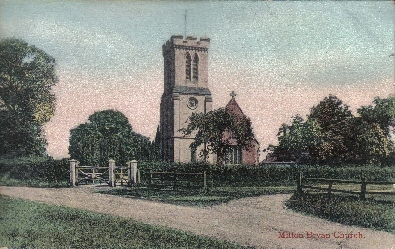 Milton Bryan Church. An unsent card. “Sandpine Series No.4”. 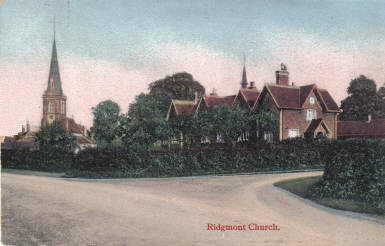 Ridgmont Church, and the corner of Eversholt Road. Unsent. “Sandpine Series No.5”. 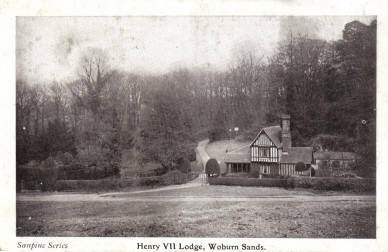 No postcard set on Woburn Sands is complete without one of the Henry VII Lodge! Sent from members of the local Carwell-Cooke family to relatives in the Pyrenees, France. “Sandpine Series No.6”. 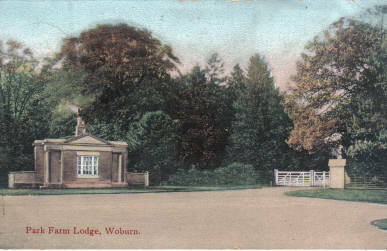 Ivy Lodge, on the Duke of Bedford’s Estate, just outside Woburn on the London Road. Posted in 1908. “Sandpine Series No.7”. 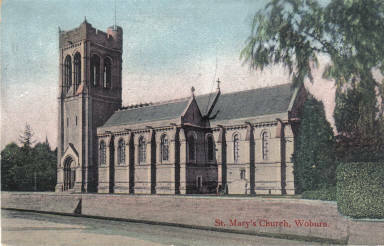 St. Mary’s in Woburn, sent in August 1906. “Sandpine Series No.8”. 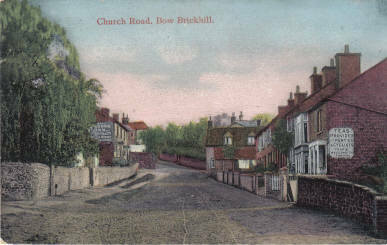 The centre of Bow Brickhill, looking down Station Road from the junction with Church Road. Unsent. “Sandpine Series No.9”. 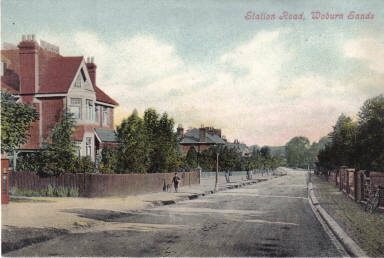 Looking up Station Road, Bow Brickhill. The school is on the left. A much narrower road than today. “Sandpine Series No.10”. 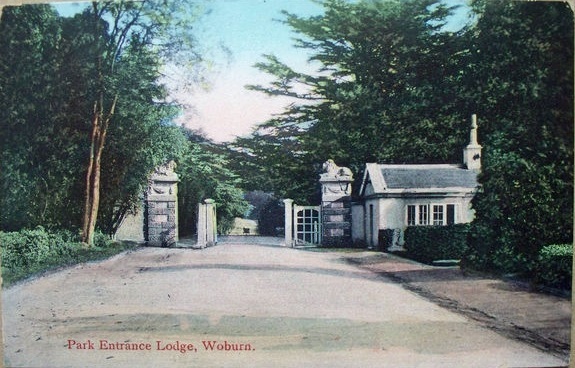 Looking at the lodge at the entrance to Woburn Park. Unsent. 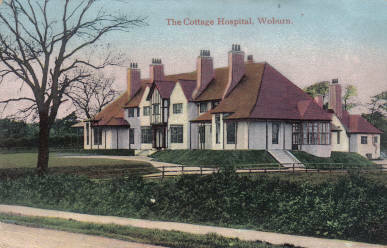 “Sandpine Series No.11” Built in 1903 by Mary, Duchess of Bedford, where she assisted on the wards. It has until recently been an adult education centre. Unsent. “Sandpine Series No.12” Back to church views, with this one of Husborne Crawley. Also unsent. “Sandpine Series No.13”. 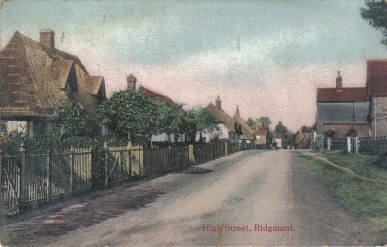 Ridgmont High Street. Possibly from someone attending the Agricultural Institute there, as the card says they are looking after the poultry this week, and attending lectures!. 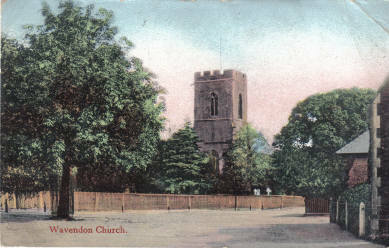 Sent in 1907. “Sandpine Series No.14”. 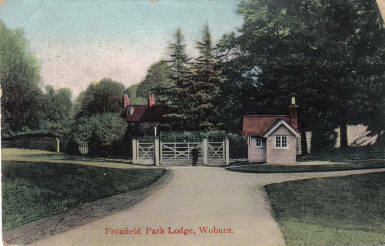 Froxfield Lodge stands just outside Woburn Park towards Eversholt. 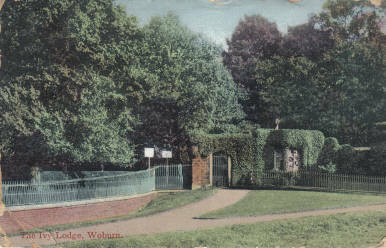 A house nearby was once the home of local author and Quaker, Benjamin Wiffen. Used in 1906. “Sandpine Series No. 15” Another of the attractive lodges around Woburn. 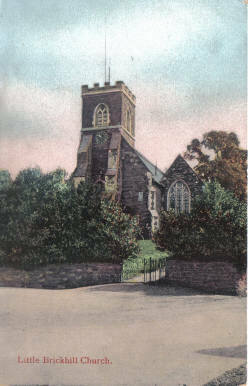 This card sent in 1906. “Sandpine Series No.17” Great Brickhill Church. This was sent to Miss Henson in the Lift Dept., at the Hotel at Lime Street Station, Liverpool in 1906. “Sandpine Series No.18” When out with his camera, it must have been easy to do the two Brickhills at the same time, so here they are together in the listing! 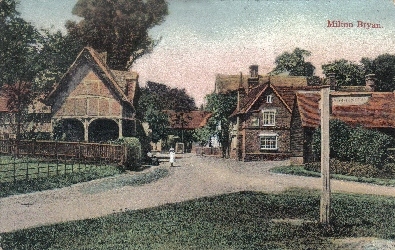 “Sandpine Series No.19” Back to Milton Bryan, and a view of the centre of the village, with the Red Lion on the right. Unsent. “Sandpine Series No.20” Possibly the furthest away from his Woburn Sands shop, and 35 years before it became so vital to the War effort, Bletchley Park was then just a beautiful house with spectacular gardens! This view from 1906. 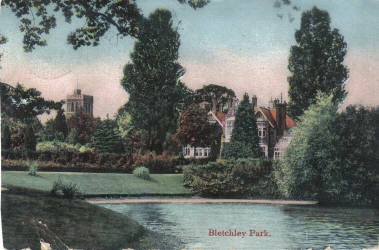 “Sandpine Series No.21” Staying in Bletchley, a view of Water Eaton Village, before it was absorbed into Bletchley. 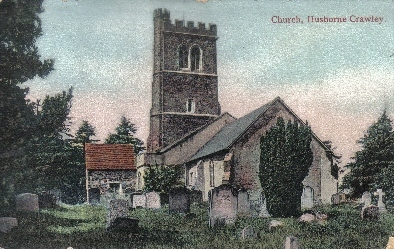 Sent in 1906. “Sandpine Series No.23” …and Aylesbury Street again, looking the other way. This one sent 1908. “Sandpine Series No.24” Our modern-day Simpson, spelt the older way, with a “y”. Sent by the same person as the card above, but six months later. This ends the numbered cards I have, but there are plenty more from Gregory that are not in the numbered series…. 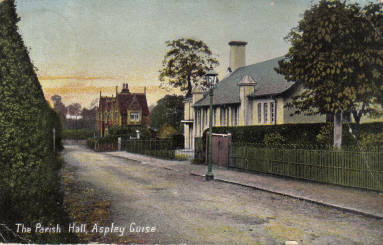 Aspley Guise Parish Hall. Used in 1908. Although clearly marked “Sandpine Series”, not numbered. 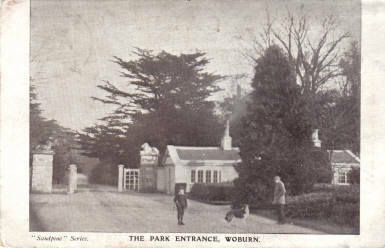 The entrance to Woburn Park. Used in 1908. 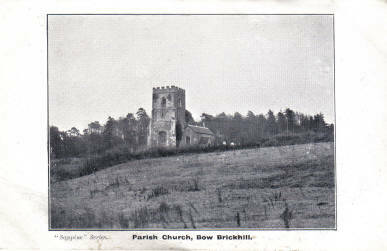 Bow Brickhill Church before it was shrouded by trees. The card is unsent, but has “Phyllis May Louise Dorman 1905” written across the rear. Note the “Sanpine Series” name, with no ‘d’. A misspelling, or had Gregory changed his trading name? 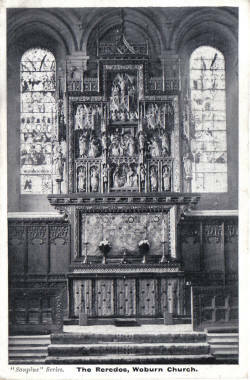 The Reredos of Woburn Church, again with “Sanpine Series”. Used in 1905. 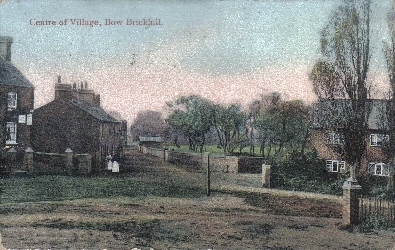 East Street in Aspley Guise, looking towards the Square, with the Bell Inn centre left. 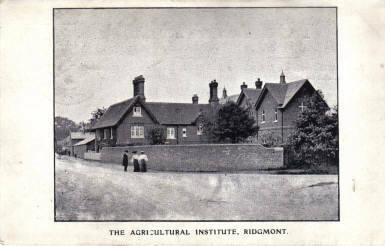 The Agricultural Institute at Ridgmont was also known as The Farm School, and was split into two houses on the retirement of the last tenant farmer in 1983. 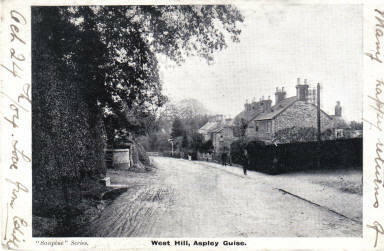 Looking down West Hill in Aspley Guise, in 1904. A card sent as birthday greetings to Elsie in St Helier. 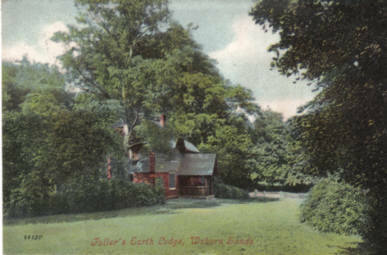 The Fullers Earth Lodge on the Woburn Road. This appears to be a joint venture with Valentines, the national postcard company. It has one of their codes on, 44120. Used in 1906. 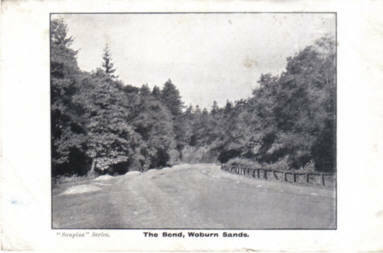 Yes, you really can go around the Bend at Woburn Sands….. A 1906 card. 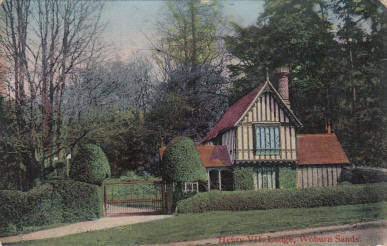 The Henry VII Lodge makes another appearance in Sanpine cards. This one posted in 1905. 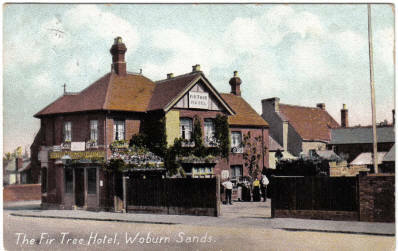 A batch of cards possibly produced for Benjamin Garratt, the landlord of The Fir Tree at Woburn Sands. The earliest I have seen this card used is 1907. 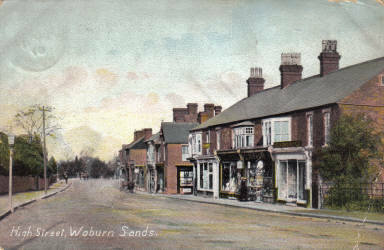 A broad, empty High Street in Woburn Sands on this 1907 view. looking north. 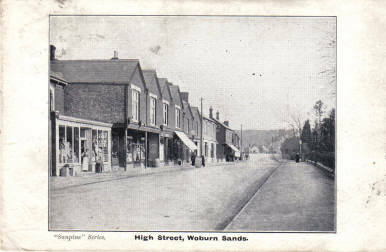 A view back along the High Street, Woburn Sands, looking south. 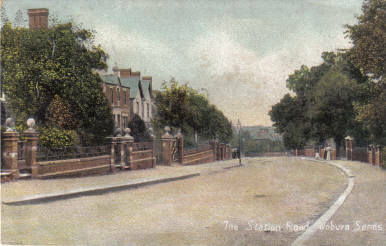 Station Road also looks very open and sparse here in 1907. 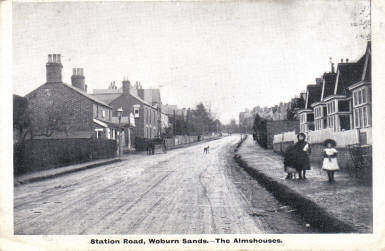 The junction of Theydon Avenue with Station Road, Woburn Sands. Unsent. 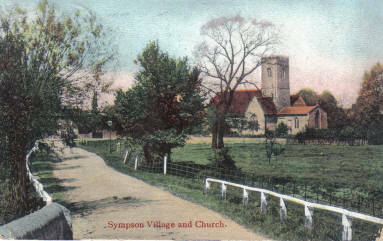 This card does not feature the names of Gregory, Sandpine or Sanpine, but this image appears in his 1904 Guide book, so I am fairly certain it was produced by him. Unsent. 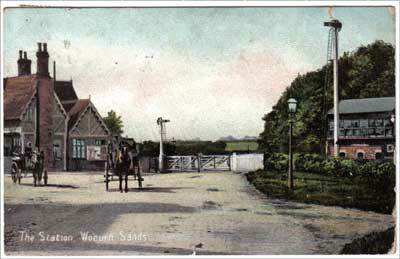 The Woburn Sands Station in 1910. 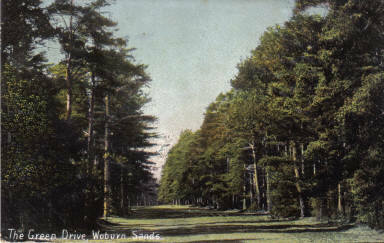 Every postcard producer had Woods cards to sell to those who came to take the healthy airs, by walking in the pine woods. 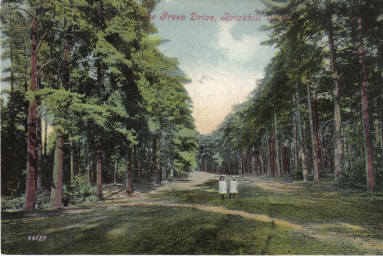 This was sent in 1908 from someone staying at Homewood on Aspley Heath. 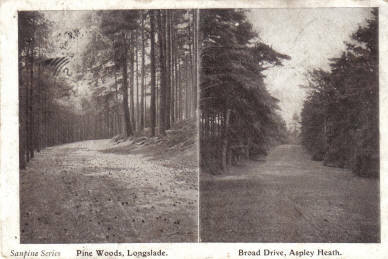 An unusual composition of two woods views, The Pine Woods at Longslade and the Broad Drive at Aspley Heath. A lovely sunny day in the woods, 1907……. …and another, written in German and sent to Germany in 1906, with Christmas greetings. 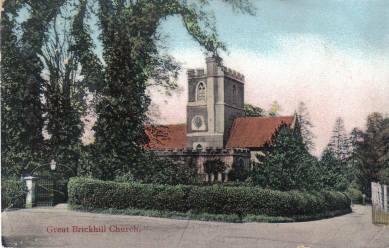 And lastly, another view of St. Michael’s Aspley Heath, posted in 1905. 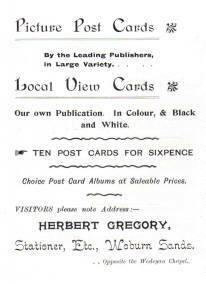 If you have any Gregory – Sandpine cards that I can add to the display here, I would be pleased to hear from you.